Fast forward to the end of March and I arrived as usual with my partner in crime and brother Matt, in addition to my girlfriend Sarah and fellow angling companion James. 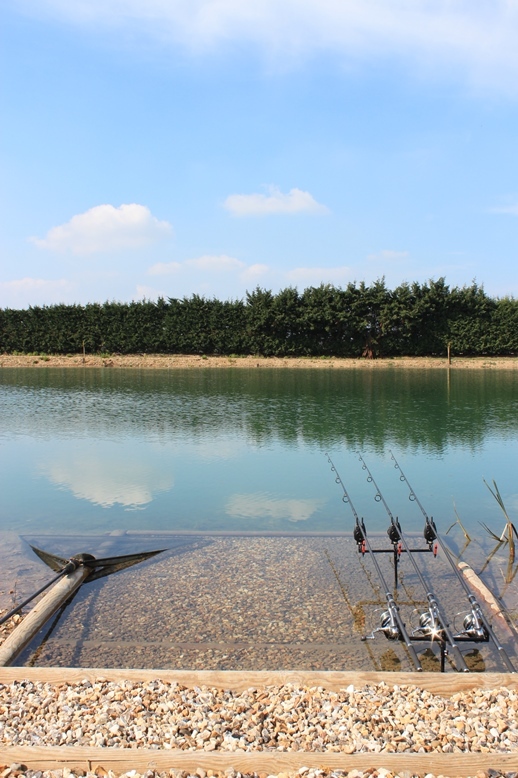 The location was Angling Line’s newest venue, Deux Isles. 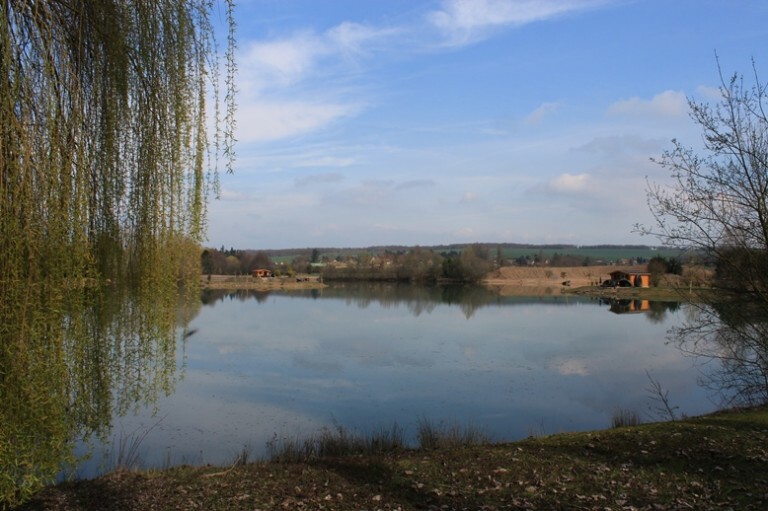 Nestled in the rolling Normandy countryside, a short distance from the picturesque town of Pacy sur Eure, this seven acre lake is the labour of love of owner Bruno Simond. At 23 he could be considered quite young to be taking on such an ambitious venture. However what he lacks in years he more than makes up in drive and determination and, upon arrival, it wasn’t hard to see the amount of graft he’s put into the place. Greeting us with fresh coffee and croissants we sat in his rather eclectic bunker, a relic of the lake’s former life as a family duck shooting lake. 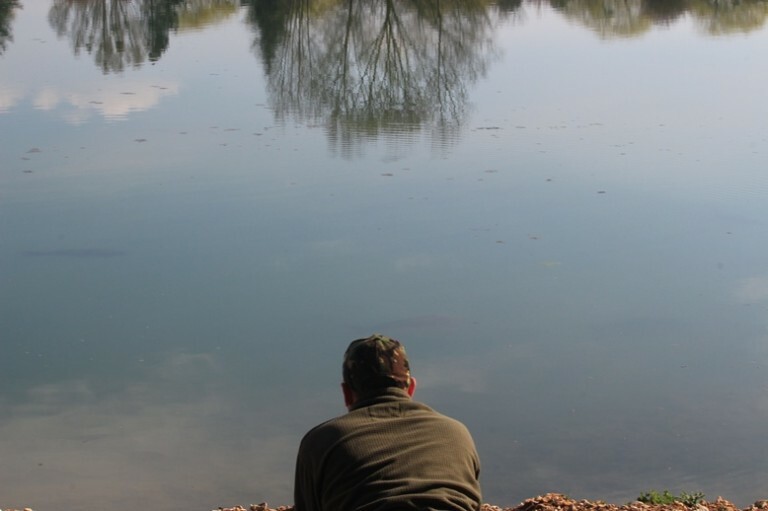 The lake has been in his family for over 50 years since his grandfather dug it and, since taking over responsibility for its running, Bruno has switched the focus from ducks to carp. Having such a close connection to the lake (he caught his first ever carp from the lake as a young boy) has certainly proved to be an advantage. He has, by all accounts, transformed the place into a venue fit to accommodate even the most discerning angler. With two islands (hence the name) set in adjacent corners of the lake, he has created two purpose built cabins to an incredibly high standard, complete with beds, tiled floor, breakfast bar and mains electricity. 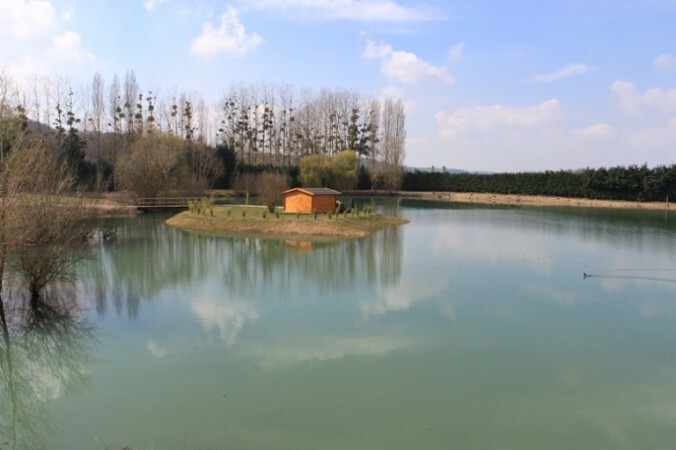 The lake is perfect for between four to five anglers and is the ideal kind of water to introduce new anglers to fishing in France, in addition to partners and family. Back on the mainland Bruno has also invested in a terrific shower and toilet block as well as a spacious kitchen area, complete with sink, fridge freezer and a plentiful supply of hot water. So, with a quick inspection of the facilities confirming that we would be living in total comfort for the duration of our short trip, we set about doing a lap of the lake with Bruno providing the commentary of the features, best areas to target and advice on what tactics he felt would enable us to put some of his incredible looking fish on the bank. We decided to split into two groups, Matt and James would occupy one island, whilst Sarah and myself would be based in the cabin on the north east corner, with Bruno fishing alongside us from the comfort of his bivvy outside. The plan was quite straightforward.  We would, between the four of us fishing, cover the majority of the water, to ensure that there was sufficient line pressure to make sure the fish didn’t hold up in one particular area. Despite a seemingly mild winter (shorts and t-shirt weather in February by all accounts) we were met with the kind of conditions that would be more familiar in my own part of the world at this time of the year. A slow moving band of drizzle and steady south westerly had set in since our arrival and it made ideal conditions for the fish to get their heads down. This was confirmed by the number of fish crashing towards the far bank in Matt and James’ side of the lake, so they wasted no time in getting their baits in the water. Having to set up my filming equipment and ensure the cabin was sufficiently prepared so that Sarah and myself could live in relative comfort, I hadn’t even had chance to put my gear together before I notice Matt on the far island running with intent to his rods. After only a few hours he’d managed to get an immediate take, so I hastily gathered up my camera and tripod whilst Sarah followed with the remainder of the filming gear. Despite it taking me a few minutes to reach them, luckily the fight was quite lengthy and it enabled me to get a good amount of footage shot. And, after a tough battle, James slipped the net under the first fish of the trip and a cracking start for Matt. It was a fantastic looking specimen, a mirror with a very pale complexion, bordering on a ghost carp. It was quite easy to see from its frame that it was into the 30’s, so it was not surprise when it made 35lb 2oz on the scales. As the drizzle set in we shot a little more footage of the fish before Matt slipped it back with a smile of quiet satisfaction. What a terrific start! Bruno had remained on our island throughout the duration of the fight so as not to overcrowd the area but he was clearly delighted to hear that such a good fish had graced the bank in record time. With the initial excitement over it was time for me to concentrate on getting my own rods cast out! 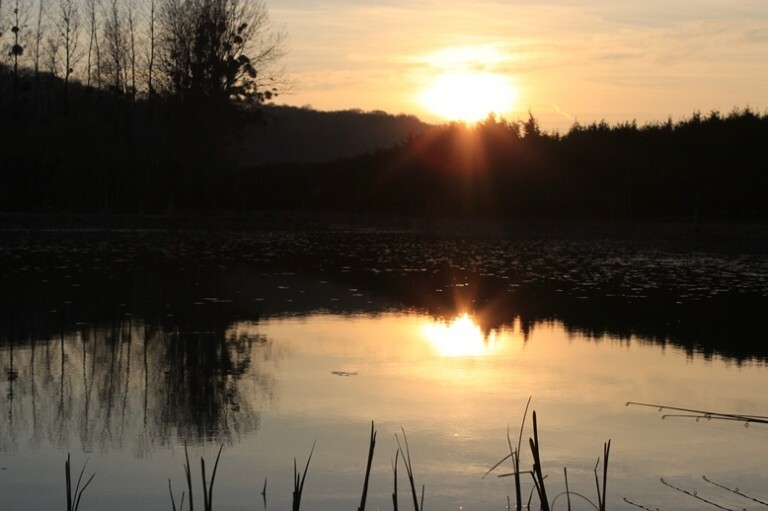 With the light fading fast and tiredness setting in after the drive the previous night, I debated whether to fish with just two rods instead of three for the first night. However temptation got the better of me so I hastily dropped the third rod immediately to my right in the channel that surrounds the islands. A bright yellow pop-up surrounded by a few handfuls of hemp would have to suffice. So, as I retired to the cabin for a well earned night’s sleep, I wasn’t expecting much to happen, given that my preparations had been delayed by Matt’s early fish. Imagine my surprise when, at 5.30am, the receiver on my alarms screamed into life. I quickly stuck my boots on and ran outside, convinced it was one of my first two rods and was stunned to discover it was the channel rod that had tripped up one of these unsuspecting carp. Having to get the fish under control proved incredibly tricky as it had set off like a steam train across the swim and was in danger of not only crossing my other two lines, but also Bruno’s to my left. The force of the fish was incredibly and, as Bruno had warned, it did fight unbelievably hard. Having to try and counter the force that the fish was exerting to the other end of the argument proved a step too far and, after a minute or so, the fish had clearly got the upper hand. It came with that sickening feeling that the rod suddenly became motionless in my hand as the tell tale bump signalled the hook had pulled. Regardless of how many times you lose fish, it’s always a deeply disappointing feeling and I trudged back to the cabin with a sense of resignation. I remained upbeat however that we had seen two bits of action in a short space of time so my optimism was retained for the few short days we had in front of us. Given the recent run of mild weather in the region it was something of surprise when Bruno informed us that we were expecting a prolonged period of very heavy rain during the following day. Mother Nature clearly hadn’t read the script and promptly threw a bucket load of the wet stuff at us for the next 18 hours. Not the ideal conditions for filming as you can imagine and clearly the carp weren’t too impressed either. Normally the carp we’re more used to targeting back in England have grown accustomed to such conditions but it was clear that their Gallic counterparts refused to work under such conditions and promptly shut up shop. After seeing the high level of activity the day before it was frustrating to have to sit and wait it out. Nevertheless we knew the weather for Friday was due to be glorious so the chance to film (and hopefully catch some more fish) wasn’t too far away. Thursday night proved to be one of those unexpectedly chilly spring nights, with a frost setting in across the lake. 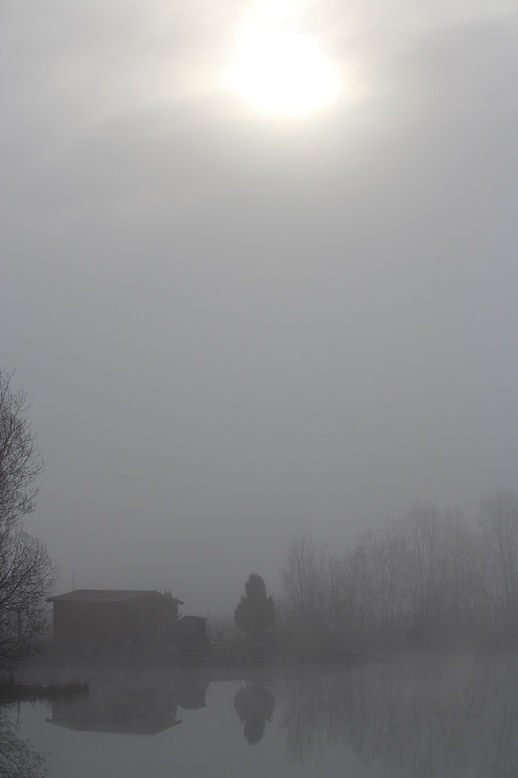 The early hours brought about an eerie fog which set thick across the water until the sun was able to burn through at around 11am. From a flat, monochrome landscape the suns rays instantly brought the place to life and spring had well and truly sprung. Swallows suddenly appeared on the wing and, in that typical spectre-like fashion, the carp silently ghosted into view, cruising around lazily a few inches beneath the surface, their tell tale slate backs glinting against the dazzling blue water. Unfortunately for me this prompted the signal to reel in my rods as my filming commitments restricted my fishing time, but it was thoroughly enjoyable to amble around the place, picking out the best features to film and also having a more in-depth conversation with Bruno. With a good amount of footage in the bank I dropped in on Matt and James to see how they were getting on. 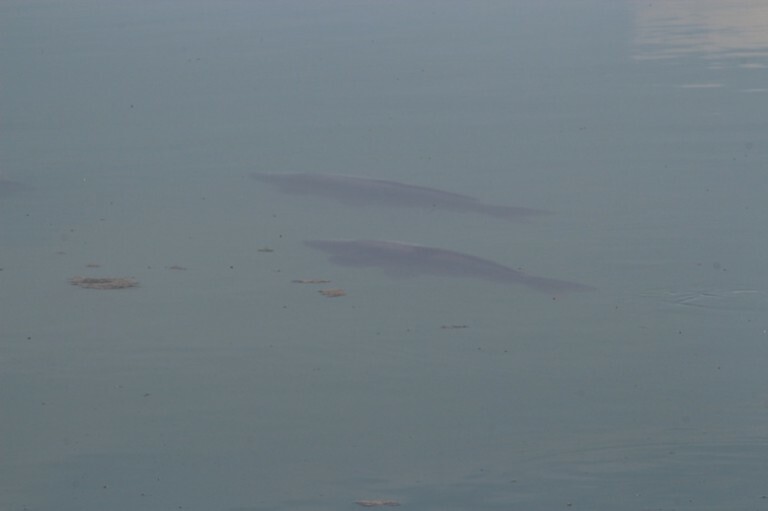 It wasn’t hard to see what they had in front of them, as a huge shoal of fish could be seen basking in the sun, around two thirds away across to the far margin. Deciding our time was better spent observing than trying to tempt one to drop down to the lake bottom to feed, Matt reeled in and we quietly headed round to the far side, to observe the stock at close range. It was an impressive sight. There were around 80-100 prime looking carp milling around aimlessly on the surface, enjoying the warming rays of spring sunshine. The majority looked to be in the high 20s to mid 30s but the shoal was punctuated by one or two much more substantial looking individuals. After a few minutes observation we both spotted one fish in particular that was simply massive. 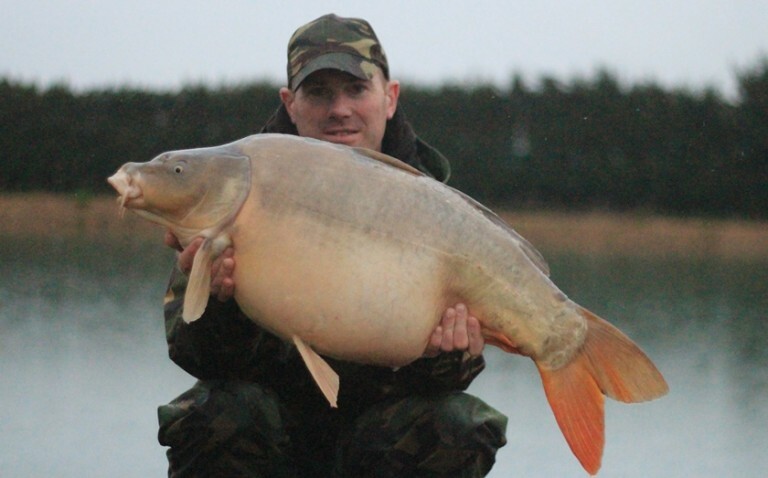 It’s profile was almost double the size of its shoal mates and was most likely one of the two biggest fish in the lake, which at the right time of year are both on or above the 50lb mark. The width across its shoulders was incredible and it suddenly sparked that sense of excitement that we could have the potential to catch something really special. Shooting a bit more film of the fish cruising around was an enjoyable way to spend a balmy spring afternoon but it couldn’t make up for the fact that I hadn’t got a line in the water. So as the afternoon wore on I made my way back to the island to mull over tactics for the evening ahead. After a chat with Bruno we promptly came up with a joint plan of attack and set about laying our traps in preparation for the night ahead. At around 1.30am Bruno’s alarms sounded a hesitant take and, despite getting to the rod in double quick time, he couldn’t make contact with the culprit on the other end. The night passed uneventfully for yours truly as I woke just before first light to another foggy outlook. The next morning signalled our final full day of our short stay, so again filming was the top priority on my agenda. Having seen a lot of activity the day before, we set about trying to capture some underwater footage of the fish. Matt had spotted a shoal of around 25 fish under a tree to the right of the bunker and promptly set about gearing up a stalking rod, to see if we could get some up close action for the camera. Under a very simple float rig, complete with signal lob worm on a size 10 hook, Matt snook into position and we watched as dozens of big French carp cruised in and out of the swim. It proved to be an enjoyable but fruitless couple of hours, the fish just weren’t intent on feeding, even on something as inconspicuous as a humble worm. Evidently the same was true at the other nearby Angling Lines water Molyneux. The unusual weather patterns seemed to have contributed to a low tally of captures on that water as well. Despite this though, we enjoyed our final evening sitting in the peace and tranquility of our surroundings, with a delicious pizza that Bruno kindly arranged along with a couple of glasses of a good French red. Reflecting on our trip we all felt that we’d been unlucky with the timing more than anything else. It was abundantly clear that the lake was chock full of stunning looking fish and the potential of the place was easy to see. I even popped into to shoot some footage of the nearby river l’Eure at the back of the complex, which was uncharacteristically swollen and heavily coloured. A sure sign of the unfortunate weather we’d had to contend with. At the right time of year Bruno informed me it produces carp approaching 40lb, in addition to specimen barbel and tench. Clearly a prospect for another visit then and something I would definitely suggest anyone investigates during their time on the complex, as it could be a shrewd tactic to rest the lake whilst angling for a bit of the unknown in the running water! As we came to pack up on the Sunday morning, Bruno chose to fish on and managed a further brace of fish consisting of a solid looking mirror into the 30s and a clean cut mid 20 common. With spring only just around the corner, we were all confident the fish would wake up fully and begin feeding in earnest. Just two weeks after we returned from Deux Isles, this was proved the correct prediction, as Bruno welcomed his first paying customers who went on to catch an impressive tally of 25 carp between two anglers during a week long session. This included fish five 40lb fish and nine 30s.